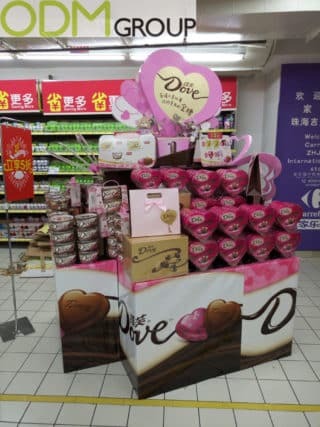 This particular display was found in the Carrefour supermarket, and Dove have used a bright display on which the products on promotion have been stacked. The display was complete with a large colourful heart including the company logo so that it can be seen from a distance. Why we like a Custom Made POS Display? Brand value. A large custom made POS display makes the company more important in the customers eyes, and as a result increases customer loyalty, especially if the display is in a place they attend regularly, e.g. supermarket. Easy customization. A custom POS display can be made in any size, shape or colour to ensure that the promotion is unique and targets the key customer base. But it also ensures that the custom POS display upholds the brands core and reputation. Brand visibility. As well as being unique and eye catching, a custom made POS display also ensures that the brand logo is well placed in order to attract potential new customers. Also, this unique and eyecatching POS display will create interest in the brand and this will spread by word of mouth, and as a result increase the brand visibility. Boosts sales. An on premise custom made display is a fantastic way to boost sales from the existing customer base, but it is also a great way to introduce potential new customers to the brand. If you are interested in a custom made POS display, please do not hesitate to contact us. Here at ODM we can assist you with the sourcing, design and manufacturing of any custom made POS displays you may require.